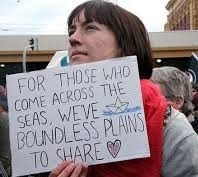 Advance Australia Fair: Our national anthem but, over more than two decades now, a ‘fair go’ has not been extended to everyone who comes across the seas – asylum seekers in particular. Most people in the community have no direct information about asylum seekers or contact with them, but rely on mass media and, through it, the voices of politicians. The latter have created a crisis mentality, reducing human beings to ‘boat people’, ‘illegals’, ‘queue jumpers’, ‘terrorists’, and ‘economic migrants’. John Howard, former Prime Minister, is remembered for his 2001 statement about deciding who could come to Australia and the circumstances of their arrival. He extracted political capital from his fabricated story about asylum seekers throwing their children overboard, polarising community attitudes and fuelling prejudice against asylum seekers (as the sort who would behave in this abhorrent way). Tony Abbott, current Prime Minister, has spoken in parliament about ‘boat people’ without any reference to them as asylum seekers. His ‘stop the boats’ mantra is combined with a shroud of secrecy about what is actually happening. Scott Morrison, current Minister for Immigration and Border Protection, has made it his mission to send people back where they came from, or to offshore processing centres on Nauru or Manus Island, within 48 hours of their arrival. Inhumane views have taken root in the community and asylum seekers are seen as failing some unspecified legitimacy test and as behaving illegally in seeking asylum. Compassion and understanding are generally qualified by BUT statements. If only they came the right way. If only they didn’t try to bring their way of life with them. If only they came with the intention to work. Inhumane policies and practices increase the stress, sadness, confusion and trauma of seeking asylum in the first place. Prolonged immigration detention has had particularly damaging effects in terms of depression, post-traumatic stress, self-harm, and suicidal thoughts and attempts. The situations people have left behind in their homelands are persecutory and traumatic; their circumstances in Australia reproduce similar effects. One of the ways people have tried to tackle negative attitudes to asylum seekers is to shame those who hold them. Websites and Facebook pages have been set up for the purpose, but this is not a productive approach. It can increase tension, entrench positions, and make it harder to create social change. Instead of shaming individuals, we need to be social justice advocates and educate others about reasons people seek asylum. If more people could be exposed to the experiences and stories encountered every day at places like the Asylum Seeker Resource Centre (in Melbourne) their views would change. 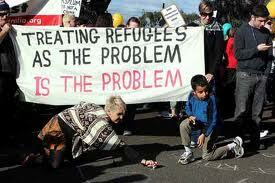 It is NOT illegal to seek asylum, despite persistent use of this term by politicians to deliberately inflame prejudice. Approximately 90% of asylum seekers who arrive by boat are recognised as refugees when their cases are assessed under the Refugee Convention. The notion of an orderly queue is fictitious. Asylum seekers would love to work but most are not allowed to do so under existing policies. Such facts do not find their way into mainstream media, or are buried under the sensationalism, but could change the views of many Australian citizens. Australians are compassionate, but only towards people they believe deserve it. If people are portrayed as doing something wrong, then judgement displaces compassion. I would like to see activists stay strong in fighting dominant politics and mainstream media and working to restore compassion across Australia. We have the ability, and the capacity, to give asylum seekers the real ‘fair go’ that our national anthem celebrates. Davidson, G., Murray, K., & Schweitzer, R. (2008). Review of refugee mental health and wellbeing: Australian perspectives. Australian Psychologist, 43(3). Essex, V., Medianu, S., & Lawson, A. (2013). Uncertainty, threat and the role of the media in promoting the dehumanisation of immigrants and refugees. Journal of Social Issues, 69(3), 518-536. Haslam, N. & Pedersen, A. (2007). Attitudes towards asylum seekers: the psychology of exclusion. In D. Lusher and N. Hashim (eds), Yearning to breathe free. NSW: The Federation Press. Marr, D. & Wilkinson, M. (2003). Dark victory. Sydney: Allen and Unwin. McKenzie, J. & Hasman, R. (2013). 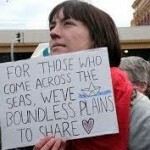 Deterring the ‘boat people’: Explaining the Australian government people swap in response to asylum seekers. Australian Journal of Political Science, 48(4). Suhnan, A., Pedersen, A., & Hartley, L. Re-examining prejudice against asylum seekers in Australia: the role of people smugglers, the perception of threat, and acceptance of false beliefs. The Australian Community Psychologist, 24(2), 78-97. Katie is currently a student in the combined Social Work/Psychology degree at RMIT University in Melbourne. She developed a passion for fighting for the rights of asylum seekers while volunteering at the Asylum Seeker Resource Centre. After graduating, she would like to travel abroad to observe social work organisations and extend her professional knowledge before working in the criminal justice field in Australia. Thanks so much for reading my article. It is absolutely horrible what our government is doing to these innocent people. Helping change other peoples thoughts on this issue is one way we can help fight for social justice. Thank you for taking the time to read my essay, I greatly appreciate your feedback. The articles written by Julian Burnside were both very interesting, especially the idea of making Tasmania a place for offshore processing. Congratulations, Katie, on your work which was highly commended for the 2020socialjustice student award. There was no original intention of having a ‘runner up’ but I could not let this piece pass. I wish you the best for your future…Joan Beckwith.